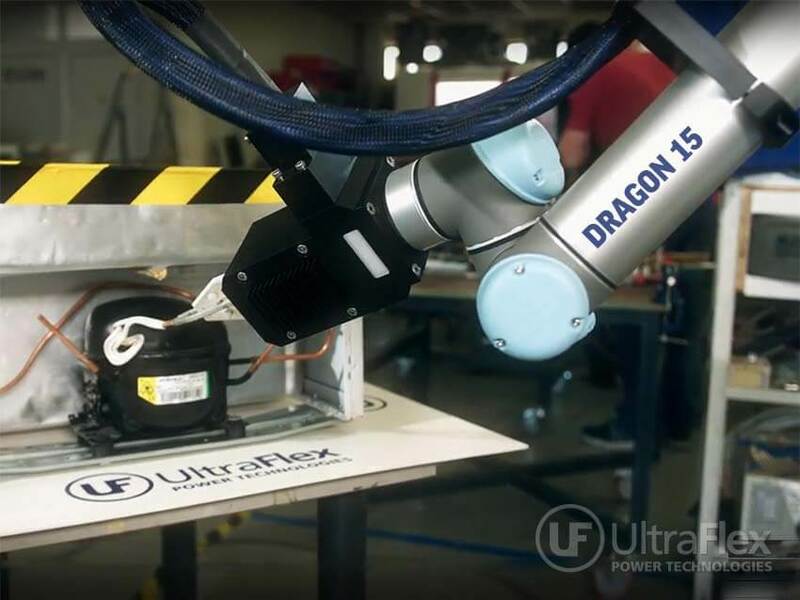 Dragon 15 integrates the Ultraflex W15 (15 kW) induction heating system with a Universal Robots cobot (UR 5) to achieve a fully automated brazing process. The induction heating system has been successfully used to replace the outdated and unsafe torch brazing widely used in the industry. 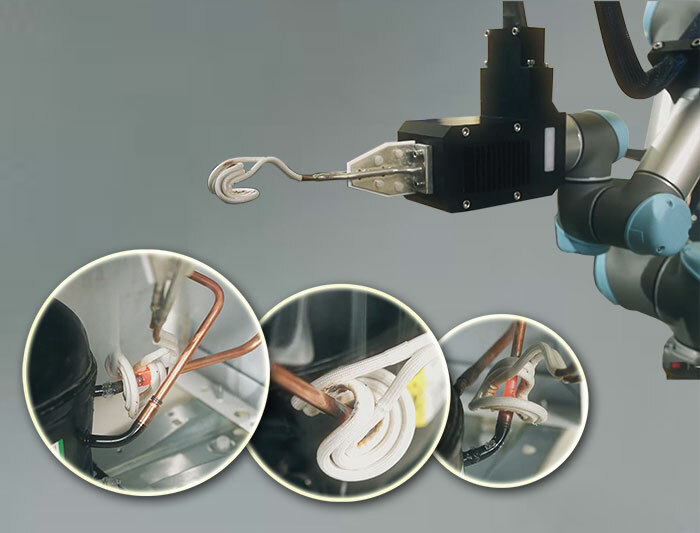 The integrated induction coil mounted directly onto the robotic arm is capable of reliably brazing multiple joints by applying controllable heat precisely positioned by the robotic arm. Dragon 15 can automatically and consistently braze multiple joints located in predefined positions in the assembly. Brazing alloy rings are placed on the joints prior to the brazing process. 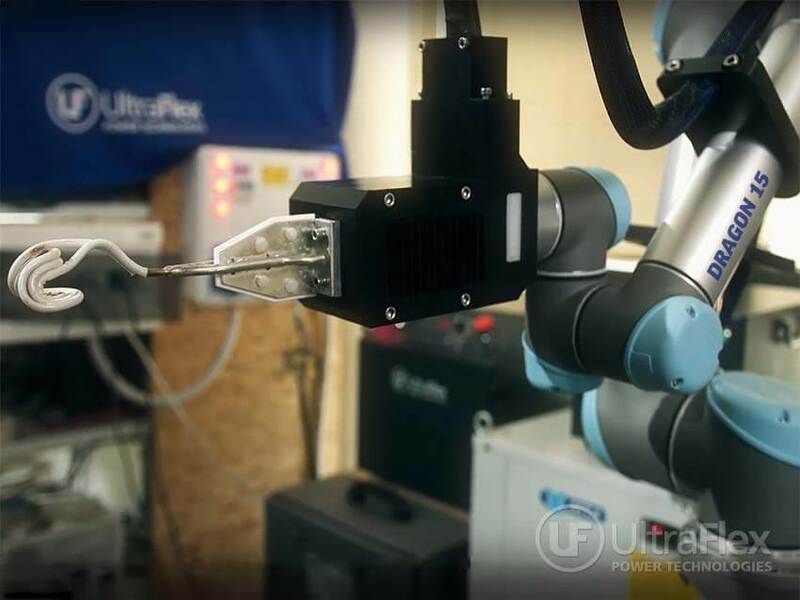 The robotic system is programmed to move to each joint and apply power for a preprogrammed amount of time to ensure a repeatable and reliable brazing process. 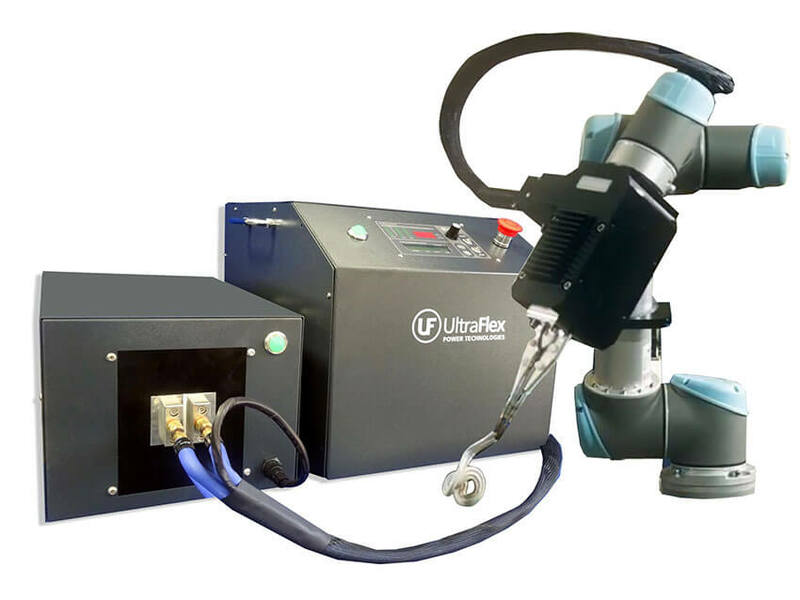 An optional automatic wire feeding system can be provided to feed the brazing alloy instead of using brazing rings. It can be used for brazing copper to copper, copper to steel, brass to copper and aluminum tubes. 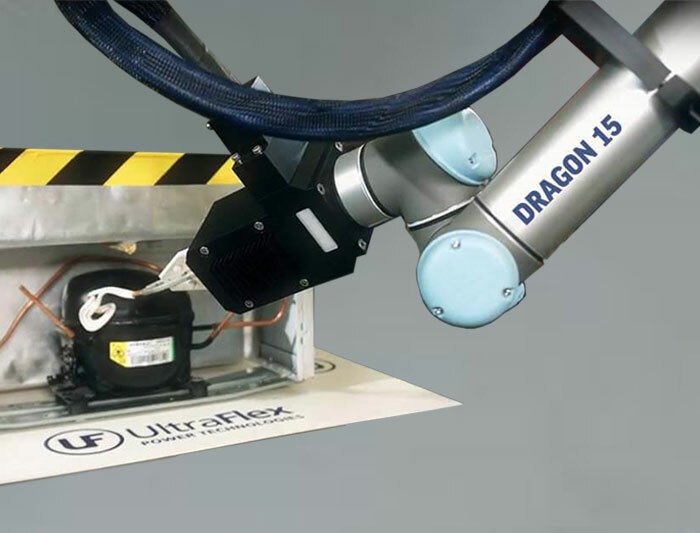 The Dragon 15 is ideal for flameless brazing of refrigerator compressors, heat exchangers, home appliance components and complex HVAC assemblies. 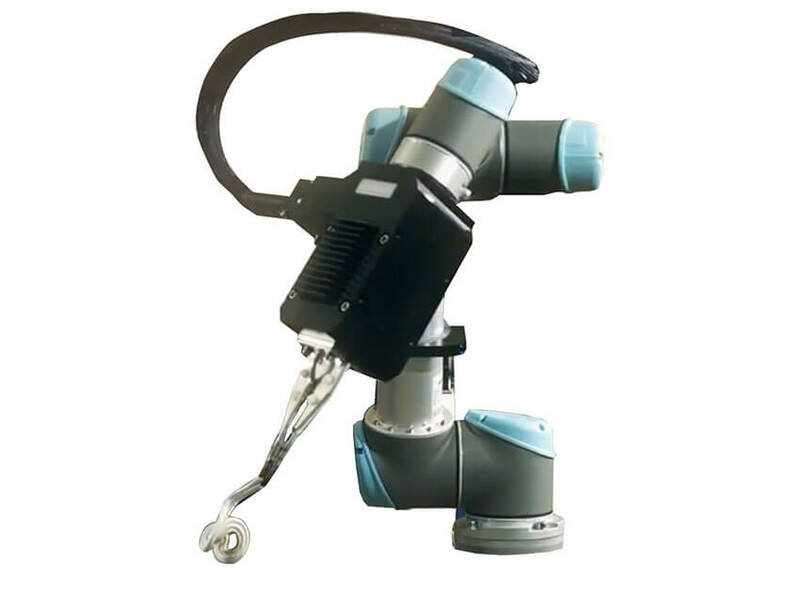 High quality and repeatability of the brazed joints is achieved by precisely controlled positioning, coil power, and heat cycle. Productivity of 4-8 seconds per joint can be achieved based on the tube sizes and the type of brazing alloy. Fully automatic process with no operator assistance required. Programmable to braze multiple joints in complex assemblies. Can be used with brazing rings (pre-forms) or integrated with automatic wire feeder to achieve fully automated brazing process. Precise quality control is possible by monitoring the energy applied to braze each joint and comparing with reference value. This flexible system can be easily reprogrammed to accommodate different process requirements. Environmentally clean and safe process with no flames or toxic gasses.